The EU has published the outcome of a workshop held on 26 November 2016. It suggests that one way of increasing the uptake of mediation would be compulsory reference to mediation before Court proceedings. They see a successful balance as being 50/50 between Court and mediation. In this report they look at how the Mediation Directive is working and the balance between Court proceedings and mediation. 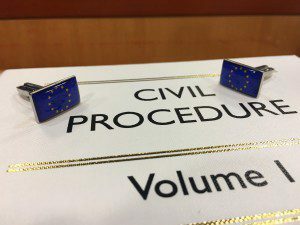 They report that there is no doubt that the 2008 Mediation Directive has been a major milestone in the European mediation movement. There is also no doubt, however, on the basis of the methodology proposed, that the key goals of the Directive remain far from being achieved. Indeed, the intention behind the Directive was to encourage more people and businesses to use mediation and to establish a balanced relationship between mediation and judicial proceedings. Eight and a half years after the adoption of the Directive, as all available statistics confirm, in the majority of the Member States mediation is on average still used in less than 1% of the cases in court: 1 mediation for each 100 cases in court. The only exception is the result of the Required Initial Mediation Session used in Italy in a small portion of civil cases, which is emerging as a best practice. There appear to be two main options to reach a balanced relationship between mediation and judicial proceedings. The first and most effective of these options would be to strengthen Article 5(2) of the Directive by requiring, not just allowing to require, the parties to go through an initial mediation session with a mediator before a dispute can be filed with the courts in all new civil and commercial cases, including certain family and labour disputes where the parties’ rights are fully disposable. This has been shown to have a significant impact in achieving a balanced relationship between mediation and judicial proceedings. As an alternative, the EU should press all Member States to use the current version of Article 5(2) to a greater extent. In particular, in its implementation resolution, the Parliament should consider asking that the Commission send a letter to each EU Government asking them (a) to measure the balanced relationship using the indexes proposed in this briefing note and (b) to explore the reasons for the failure to achieve the balanced relationship, which is the objective of the Mediation Directive. Failure to respond and to achieve the balanced relationship could lead to the evaluation of an infraction procedure for failing to comply with the Directive. If these recommendations are introduced and we stay a part of the single market, this could result in increased use of mediation in the UK.